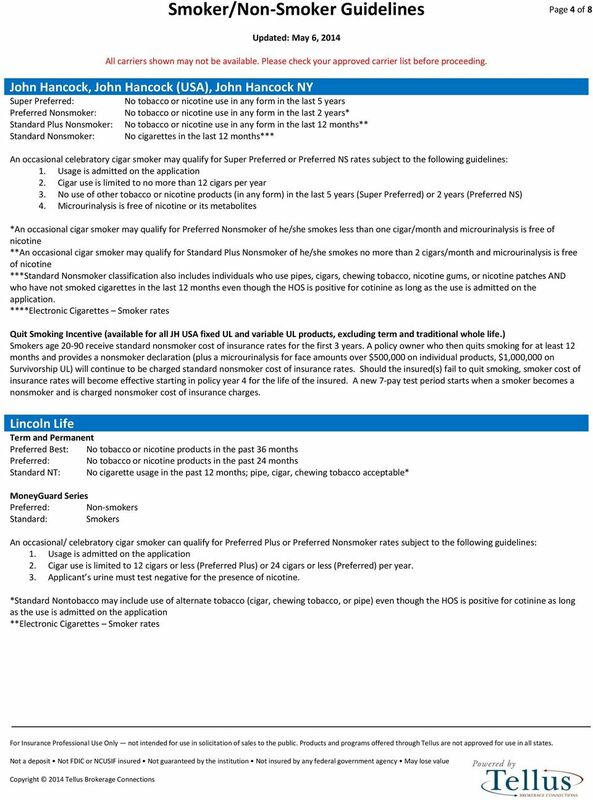 1 Page 1 of 8 American General Preferred Plus Non-Tobacco: No tobacco for 5 years Preferred Non-Tobacco: No tobacco for 3 years Standard Plus: No tobacco for 1 year Standard Non-Tobacco: No tobacco for 1 year An occasional cigar smoker may qualify for non-tobacco rates. These rates are subject to the following guidelines: 1. Use must be admitted at the time of the application or inquiry and all case data must coincide with the admitted degree of usage. 2. No more than 1 cigar per week may be smoked. 3. No nicotine metabolites may be present in the urinalysis or any other carriers' urinalysis in the last 12 months. 4. No use of tobacco products, other than occasional cigars, for at least 5 years prior to the time of application or inquiry. 5. If APS is necessary, info in the records should validate the degree of smoking reported by the applicant. **Electronic Cigarettes smoker rates If these guidelines are met, the cigar use will be considered a non-factor in the risk evaluation process. This will allow individuals to receive the best rating class if all other criteria are met. 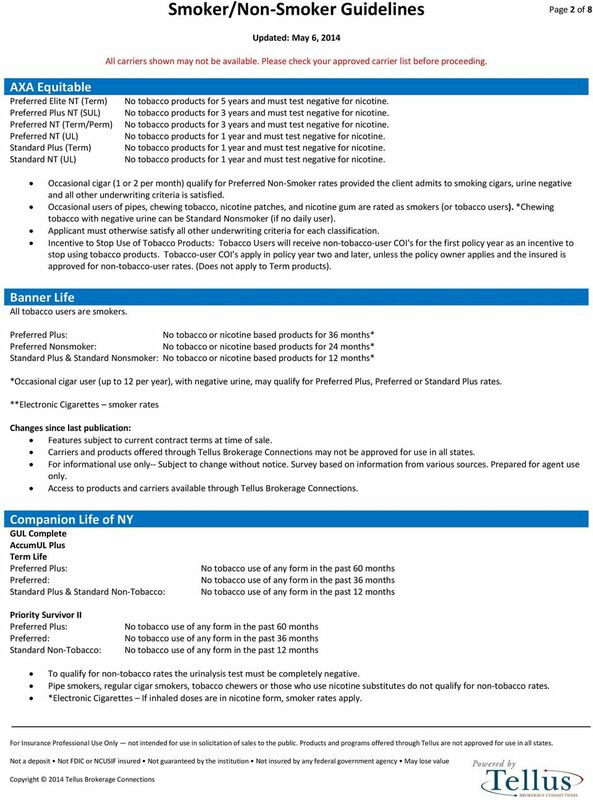 For Protection Advantage VUL and Income Advantage VUL only: Preferred and Standard cigarette smokers can receive Standard non-smoker rates for the first three policy years. If smoker shows evidence of having quit smoking for 12 months, rates will be changed to standard non-smoker permanently. 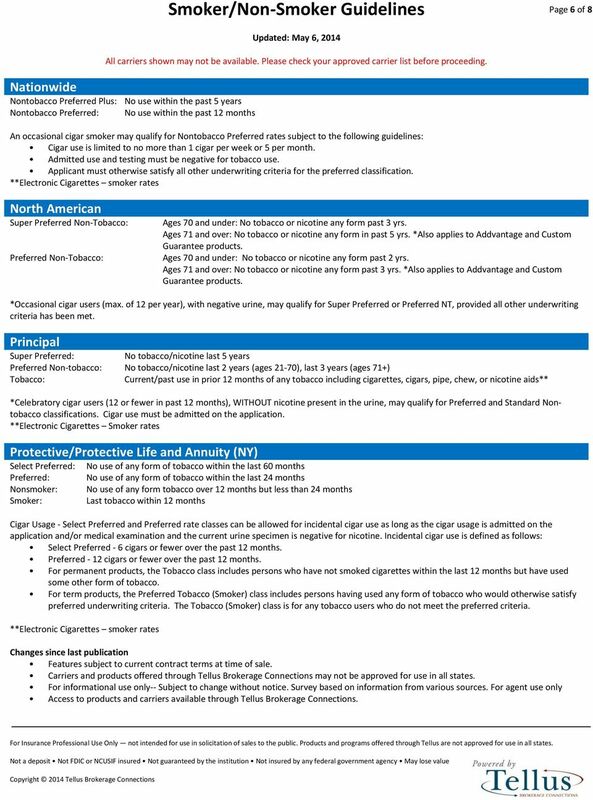 American National Preferred Plus Non-Tobacco: No tobacco for 5 years Preferred Non-Tobacco: No tobacco for 3 years Standard Plus: No tobacco for 2 years Standard Non-Tobacco: No tobacco for 1 year An occasional cigar smoker/smokeless tobacco user may qualify for non-tobacco rates. These rates are subject to the following: 1. No more than twice per month 2. HOS must be negative Aviva Term Products Permanent Products Premier: No tobacco for 60 months Preferred Plus/Premier: No tobacco for 36 months Preferred: No tobacco for 36 months Preferred: No tobacco for 12 months Standard Plus: No tobacco for 12 months Standard: No tobacco for 12 months Standard: No tobacco for 12 months 1. No more than 4 cigars per month may be smoked. 2. Occasional cigar use must be admitted on the application, including the number and frequency of such use. The LA-23A supplemental questionnaire must be included with term applications upon initial underwriting evaluation. 3. There must be no conflicting nicotine or tobacco use information found on the application, APS, examination, MIB, or inspection. 4. Applicant s urine must test negative for the presence of nicotine. 5. Absolutely no use of other tobacco or nicotine products within the past year. This includes, but is not limited to, cigarettes, pipes, chewing tobacco, snuff, or any nicotine substitutes. 6. 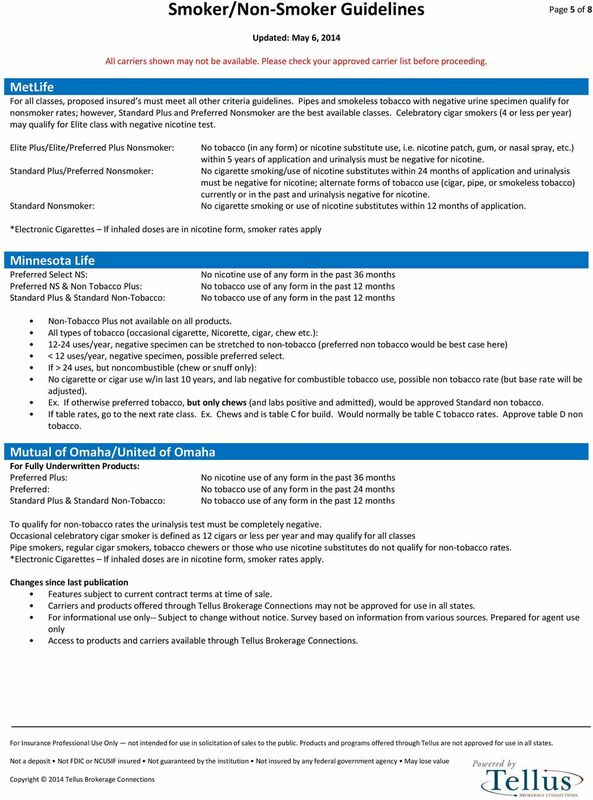 Applicant must otherwise qualify for preferred plus, preferred, or standard non-tobacco rates. *Electronic Cigarettes Non-nicotine solutions may be a nonsmoker consideration. Nicotine solutions are considered smoker rates. 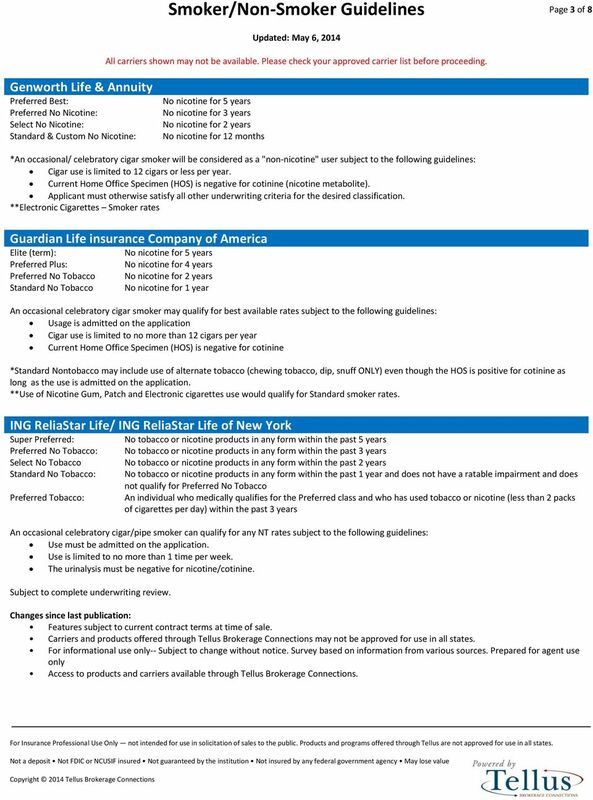 **The company reserves the right to decline this offer if, in the sole discretion of the underwriter, the occasional cigar use would pose additional mortality risk due to other health conditions of the proposed insured. 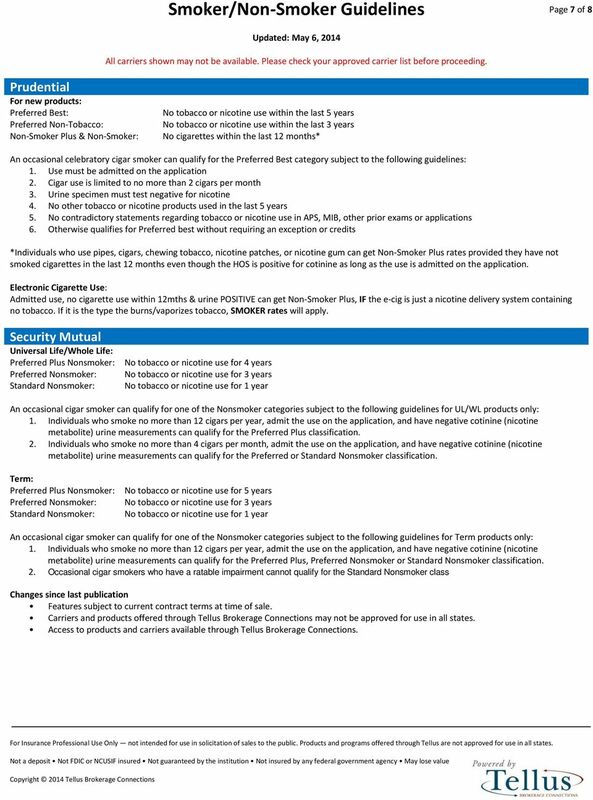 2 Page 2 of 8 AXA Equitable Preferred Elite NT (Term) Preferred Plus NT (SUL) Preferred NT (Term/Perm) Preferred NT (UL) Standard Plus (Term) Standard NT (UL) No tobacco products for 5 years and must test negative for nicotine. No tobacco products for 3 years and must test negative for nicotine. No tobacco products for 3 years and must test negative for nicotine. No tobacco products for 1 year and must test negative for nicotine. No tobacco products for 1 year and must test negative for nicotine. No tobacco products for 1 year and must test negative for nicotine. Occasional cigar (1 or 2 per month) qualify for Preferred Non-Smoker rates provided the client admits to smoking cigars, urine negative and all other underwriting criteria is satisfied. Occasional users of pipes, chewing tobacco, nicotine patches, and nicotine gum are rated as smokers (or tobacco users). *Chewing tobacco with negative urine can be Standard Nonsmoker (if no daily user). Applicant must otherwise satisfy all other underwriting criteria for each classification. Incentive to Stop Use of Tobacco Products: Tobacco Users will receive non-tobacco-user COI's for the first policy year as an incentive to stop using tobacco products. Tobacco-user COI's apply in policy year two and later, unless the policy owner applies and the insured is approved for non-tobacco-user rates. (Does not apply to Term products). Banner Life All tobacco users are smokers. 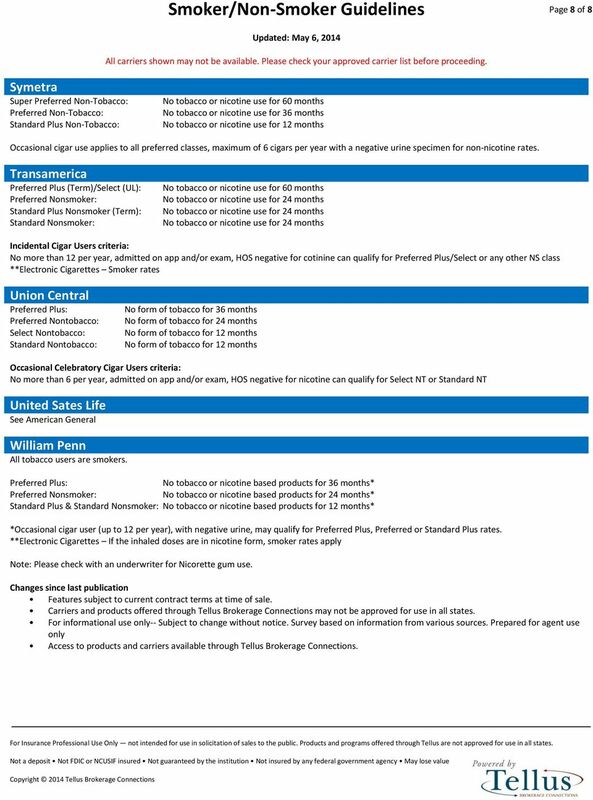 No tobacco or nicotine based products for 36 months* No tobacco or nicotine based products for 24 months* Standard Plus & No tobacco or nicotine based products for 12 months* *Occasional cigar user (up to 12 per year), with negative urine, may qualify for Preferred Plus, Preferred or Standard Plus rates. **Electronic Cigarettes smoker rates Changes since last publication: For informational use only-- Subject to change without notice. Survey based on information from various sources. Prepared for agent use only. Companion Life of NY GUL Complete AccumUL Plus Term Life Preferred: Standard Plus & Standard Non-Tobacco: No tobacco use of any form in the past 60 months No tobacco use of any form in the past 36 months Priority Survivor II Preferred: Standard Non-Tobacco: No tobacco use of any form in the past 60 months No tobacco use of any form in the past 36 months To qualify for non-tobacco rates the urinalysis test must be completely negative. Pipe smokers, regular cigar smokers, tobacco chewers or those who use nicotine substitutes do not qualify for non-tobacco rates. 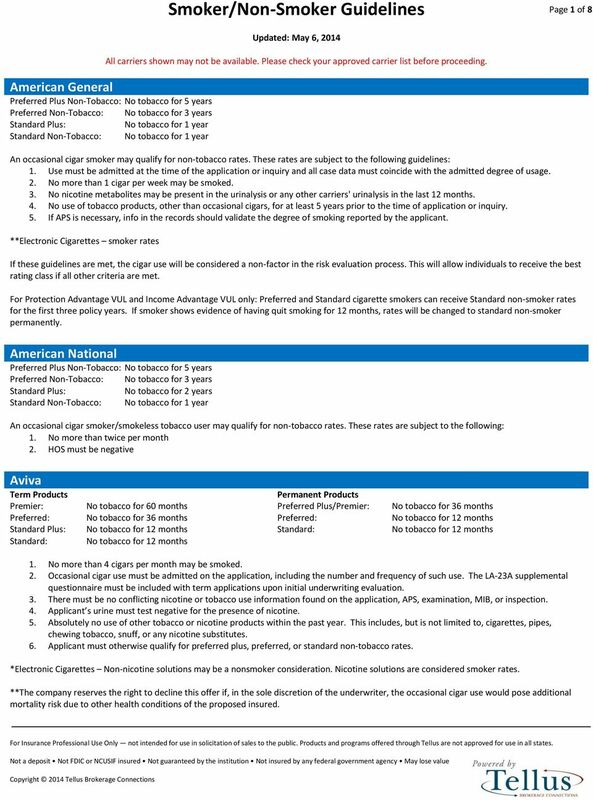 *Electronic Cigarettes If inhaled doses are in nicotine form, smoker rates apply.